The ability to turn back the clock of the body, known as age reversal, could be one of the oldest quests of mankind. The search for the Fountain of Youth reaches back into antiquity, and in modern times takes on a technological theme like what is proffered in the transhumanist philosophy. Within the secret space program, the use of age regression technology is common place and is given the name the 20-and-back program. Enlisted personnel go through a standard recruitment process, agreeing to do a 20-year tour of duty in exchange for compensation. They are often offered paid college tuition, lucrative six-figure income jobs, and plush living conditions upon their return. Yet the program never intends on honoring the agreement. Instead, after their tour of duty, program participants have their memories erased, their bodies regressed back to the age that they were initially recruited, and are spliced back into their lives 20 years before as if nothing had happened. Corey Goode's experience is one such example of this. In 1987, when he was only 16 years old, the secret space program recruited him using the same process mentioned above. After his 20-year-tour of duty, he was age regressed, blank-slatted, and spliced back into his 1987 life. But unlike the vast majority of participants, the memory-wiping or blank-slatting was not successful. Goode is amongst a small population of SSP personal, known as Intuitive Empaths, that can actually recall his SSP memories even after being blank-slatted. Goode says that the reason for this is because memory and experiences are stored biochemically in the physical body and in the etheric or "light body" as some kind of energetic database. If individuals are more in touch with their energy bodies, they can recall memories more easily, similar to restoring a computer hard drive by using a cloud storage backup. Given near-death and out-of-body experiences — wherein an individual's body physically dies for several minutes, yet the consciousness is still able to observe and form memories that are then accessible upon returning to the body — the explanation Goode provides is supported by the scientific record. Goode describes the discharge process of being age regressed, going back in time 20-years, and eventually being spliced back into his life. Age regression employs the use of paralyzing drugs or amnesia medications to immobilize the body, which is then regressed using some kind of energetic or temporal process that Goode was unable to remember much about. At the Lunar Operations Command, he was put in a medically-induced coma for two weeks, waking up later in what appeared to be the same facility, yet everything felt different. The inference was that during the regression process, Goode was actually transported back in time to 1987. Goode also provides more detail about life in the SSP, stating that it is a highly militaristic and hierarchical organization. Participants are not allowed to ask questions and are held to a strict code of conduct. They are not allowed to discuss any operationally important information with other personnel. No personal items from Earth or contact are allowed either. Finally, Goode mentions that there are health complications to this procedure, and often after the 20-year span of time has been lived out, memories of the SSP experience begin to return to even the successfully blank-slated individuals. In all cases, the SSP continues to monitor former assets after they leave the program. 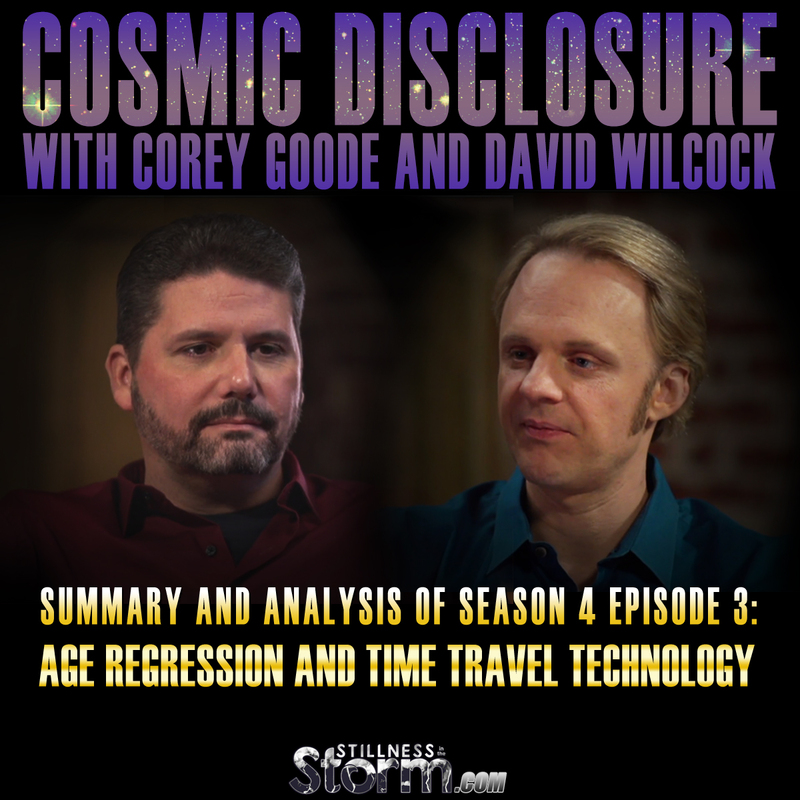 For other Cosmic Disclosure episodes that discuss the 20-and-back program and age regression, see the below-linked articles. Shem, from Discerning the Mystery, also provided commentary and a transcript of this episode, which can be found here. Click here for the previous episode in this series. For the current catalog of Cosmic Disclosure summaries click here. Episodes 1, 2, 4, 5 and 6 have yet to be analyzed, but a transcript of these episodes can be found here. If you do not already have a Gaia TV subscription and want to support Corey, use this link here: blueavians.com. For translations of Corey's updates go here. Some of the content covered here can be found on Goode's websites: spherebeingalliance.com and his older blog goodetxsg-secretspaceprogram.blogspot.com. To sign up and watch the episode click here. Corey Goode is a Secret Space Program (SSP) insider and whistleblower that began disclosing information in 2009 under the pseudonym GoodETxSG. In 2014, he started revealing a great deal more information in an effort to prepare humanity for what he calls data dumps, set to occur at an opportune moment in the future. Much of the information he provides comes from Smart Glass Pads, iPad-like devices supplied to SSP personnel for information dissemination purposes. This will be a groundbreaking event, revealing the totality of Earth's history and the activities of the Cabal which will ultimately lead to a truth and reconciliation style tribunal to hold criminal elements accountable for wrongdoing. Additionally, the SSP Alliance intends on releasing all of the hidden technology to the people in preparation for a Star Trek-type golden age civilization. According to Goode, the Cabal or the secret Earth government and their syndicates (as termed by the SSP Alliance) have enslaved humanity under a false paradigm of a technological advancement, while secretly developing incredible technology (a Star Trek level of advancement) used to colonize the solar system and beyond, engaging in trade with thousands of extraterrestrial races. Space programs have been developed in secret all throughout Earth's history, and in many cases, groups broke away from the main culture forming what is called a Breakaway Civilization. Some of these civilizations have existed in secret, on Earth and beyond for, thousands of years. The Agartha Network is one such group that claims to be the original human race. It was this group in addition to the Draco Alliance, that made contact with a secret German space program in the early 20th Century. In modern times, the Germans were the most advanced of the SSP groups, beginning their efforts in earnest during the early 1920's and 30's. The Americans were also developing a SSP, but were much further behind in technological advances. Later, the American SSPs were infiltrated and taken over by the Germans after the end of World War II. It was after this forced merger that the SSP, under the direction of the Interplanetary Corporate Conglomerate (ICC), expanded into the solar system and beyond, setting up dozens of bases and mining facilities chiefly using slave labor. In the early 1990's, a faction within the SSP known as Solar Warden slowly began to go against the ICC, allying with a group of highly evolved extraterrestrials known as the Sphere Being Alliance in 2012. Since then, more factions have joined the alliance which is actively working to free humanity on Earth and beyond, known as the SSP Alliance. Despite their good intentions, the SSP Alliance is a group of highly damaged and morally ambiguous individuals, according to Goode, that recognize at some level the need to change the status quo, but are hardly angels. The Sphere Beings are a group of five extraterrestrial races, one of which is known as the Blue Avians, that arrived in the solar system during the late 1980's. Two of the races remain unrevealed; however, there is also a race of Golden Triangle Head beings and Blue Orb beings made of light. Over the course of 20 years, they began bringing massive spheres into the solar system and surrounding area, some which are the size of Jupiter. This is in an effort to down-step galactic energy waves, which are slowly changing life as we know it. These spheres are cloaked and not detectable by the surface population of Earth. According to the Sphere Beings, a massive shift in energetic expression is now occurring in the solar system, as the result of a natural process of consciousness evolution, assisted by our solar system's movement through the galaxy and increasingly coherent energy fields encountered as a result. The Sphere Being Alliance specifically asked for Goode to represent them in SSP Alliance meetings as a Sphere Being Alliance delegate. Presently, the SSP Alliance is negotiating with the remaining cabal aligned programs, as well as innumerable races that have lived in the solar system for millions of years, and even breakaway civilizations once resident on the Earth's surface. The Sphere Beings have erected an energy barrier around the solar system preventing ingress and egress, trapping many of the negatively oriented groups that have been loosely allied with the secret Earth government syndicates for thousands of years. Since this event, the pyramid of power known on Earth known as the Cabal or Illuminati has fallen into disarray, because the Draco Alliance attempted to betray their underlings to the Sphere Beings in an attempt to gain passage out of the solar system and escape the coming justice of the SSP Alliance. SSP factions encountered many intriguing things as they ventured out into the solar system. Apparently there are remnants of extremely old settlements and technology from what is called the Ancient Builder Race. These beings were incredibly advanced, using a type of consciousness technology that appears to be an inanimate object until activated by a user. They are also responsible for building ancient stargates found on nearly every major body in the solar system. According to the Agarthans, the Sphere Beings are in fact the Ancient Builder Race, although the SSP has yet to confirm this directly from them. The dark side of the Moon is home to many different groups, including the ICC, the Draco Alliance, the SSP Alliance, the Dark Fleet, and more. The Moon is apparently an artificial object, and has become a neutral zone for all of these groups, which have maintained a peaceful armistice for thousands of years. The Moon serves as an observational outpost for over 60 groups of extraterrestrial races engaged in 22 genetic programs and social experiments on Earth. Some of these programs conflict with each other, yet all of them have influenced Earth's history for millennia. Corey Goode divulges details of each step taken in the age regression process he endured as his time with the twenty and back program came to a close. What we learn, is the prevalence of time travel technology within the secret space programs and why it is such a tightly held secret. These secrets do not stay buried forever. And when the truth is finally revealed, there will be ramifications. This interview with David Wilcock was originally webcast March 22, 2016. Summarized notes will be in black, with my commentary in [green bolded brackets]. Alterations to the transcript for ease of reading will be in [brackets], but the original content of the dialog is always maintained. The images with black letter boxing were captured from this episode on Gaia TV. Transcribed by Judith. Commentary by Justin Deschamps. DW = David Wilcock, CG = Corey Goode. DW – All right. Welcome to Cosmic Disclosure. I’m your host, David Wilcock, and I’m here with Corey Goode. And in this episode, we’re going to get into some of the very interesting controversial material that has come up consistently in the feedback that you’ve given us in the discussion forums here on the gaia website. And that is specifically this very bizarre notion of the elasticity of time and how it relates to age regression. So, Corey, welcome back. DW – So, one of the things that people have stumbled over when they first look at your website is that you explain that you had a 20-year service record in the space program, beginning in 1987, which would then lead them to believe that you would have been working until 2007, and at that time you came back to Earth. But then the timeline doesn’t seem to line up based on the other things that you said you did and when you said you did them. DW – So, are we dealing with a technology that is more advanced than people are aware of in the conventional world? CG – Oh, absolutely. <chuckling> I mean, all of the technology we’re talking about in the Secret Space Program is far more advanced than most of them can image. The 20-and-back program is a program that thousands of people have partaken in and some of them have been people in the military. DW – What does 20-and-back mean exactly? CG – You serve 20 years and come back to the original point in time you left. DW – So, what do you say to the person who believes that the technology that they can see in Internet searches represents the farthest that humanity has ever gone? How do you answer that person who just can’t believe that there’s anything more advanced than what they’re aware of now? DW – Sure. Absolutely. Why would someone in the government want to keep the knowledge of a time-travel type of technology secret? What’s the reason for why they wouldn’t just come out in the open and tell us that this is out there? CG – You can’t talk about one advanced technology, without revealing all the other advanced technologies. [If you did, that would let] the genie out of the bottle. And the major genie that they’ve been trying to keep in the bottle is – not [that] there are ET’s – [it's] is yes, there is free energy. And free energy alone will collapse the global economy overnight. Free energy devices. So …. DW – <interjecting> Or maybe transform it. It would collapse the existing …. CG – It would … it would …. DW – [Collapse the existing] power structure. DW – So, let’s just deal with some of the basics, and then we’ll get more detailed and technical. And I remember when I first started talking to you about this, it really tripped me out, and I had a lot of questions to ask. So, here’s the first question. You go out for 20 years, they time travel you back to the point that you left. You return 20 years older than what you were when you left? DW – Your body is 20 years older? CG – No. Your you’re completely age and time regressed. DW – But before that... Like, let’s say that you’re out in space and you do your 20 years, and then they fly you back. Is it the same room that you were in when it starts? They actually put you back in the exact same room? CG – Yes, you’re taken back to the same point. DW – OK. At first, when you return to that room, are you going to look 20 years older than you were when you left just a few minutes before? CG – No, no. When you’re at the point where they’re delivering you back to your point of origin, you’ve already gone through the entire process of being age-regressed, debriefed, blank-slated …. CG – Screen memories [were] added if necessary, and then, [you were] time-regressed back to the point and they usually give you screened [or false memories]. The largest number of people [who have going through this process] have screen memories of portaling in and out of their bedrooms. And that was one of the screen memories that they had given me. [In other words, the portal memory is a false one provided by the program to fill in the gap from the blank-slatting process.] But what they had done is used a technology to tell me to leave my house and they picked me up in a van. CG – So, a lot of people still have that screen memory of thinking that a light opened up in their room and they were portaled out of their room. DW – Is that the technology that would be used to get somebody to leave their house to go get picked up in the van in this case? DW – OK. OK, so you’re saying that before you get returned to the room that you left from, you’ve already been through some sort of age regression procedure. CG – Right. [The use of screen memories would be needed to provide the conscious mind some form of explanation for the seemingly inexplicable experience of the 20-and-back program. If one has ever blacked out or lost time, it can be quite unnerving, causing a upsurge of inquisitiveness and curiosity — exactly what the SSP is trying to avoid. Although the blank-slate screen-memory process is obviously highly successful, it is still vulnerable to breaking down, as made evident by Goode's ability to recall his experiences. In other words, the screen memories provide an acceptable version of the past — a believable lie — just like propaganda provides a version of events that prevents deeper investigation. Image Source: Blank-slate and screen-memory room from the TV series Dollhouse. The man in the background is the engineer who creates the screen memories and artificial personalities. Image Source - Electromagnetic blank-slate and screen-memory device used to install new personalities on to program participants. DW – Let’s just talk for a moment about what’s happening there. So, you’re saying. Let’s just walk through a hypothetical 20-year term of service. Did you do only one thing in your 20-year term of service in the space program? CG – No. I worked on several programs. I was transferred around to work on several programs. It was just a little over 20 years. And at the end of that 20 years, I was told "your time’s up. It’s time to go back home." Then I was taken back to the [Lunar Operation Command] LOC. DW – But, wait a minute. Is it normal for people to have different transfers and not just all have the same job for the 20 years? CG – Yeah. Usually they work different [programs]. It’s just like if you’re in the service, you’re going to be transferred around, you’re going to develop skill sets, your skill sets are going to evolve, and you’re not usually going to be assigned the same duty on the same vessel for the entire time. DW – That makes sense, because otherwise people would get tired and burned out. So changing things up keeps it interesting. CG – Things get boring. It’s not as exciting as people think. It gets boring a lot anyway. DW – OK. So, now you’re saying that eventually they came to you and said that it was time to go back. DW – What was the last job that you had? What was your last assignment prior to them saying that? CG – It was one of the darker assignments they had me working on that I don’t like talking about very much. DW –OK. So, by that point, you’re probably quite happy to be getting a reprieve from it. DW – Were you counting the years, were you well aware of the 20 years? DW – And looking forward to it? DW – Do people ask to get discharged early? Do they want to get out and see if there’s a way they can get out? CG – That’s not an option. DW – That’s not an option. So people know not to even bother to ask. CG – Right. If people were released for different reasons, I don’t know about it. DW – Hmm. If you tried to ask, if you say "I really don’t want to do this anymore," what’s going to happen? CG – You were to follow orders. I never saw anyone that defied orders. CG - It was very rigid, regimental situation where you were seeing things done to other people that were unpleasant. You [didn't] want to be on the on the receiving side of unpleasant things. So, you didn’t rock the boat, so to speak. You just did what you were told. DW – But you said that it was a little more than 20 years before they told you your time was up. So was there …. DW – Was there a period of time where you were [thought] "oh, my god, it’s been 20 years and now they’re not letting me go yet?" CG – No. There was a little delay before I started. I, I knew all about it ahead of time. CG – There was a little delay before I was assigned to the research vessel. They had me doing some other things. DW – So, people have had trouble understanding what this age regression is. So let’s walk through it now. They tell you, you’re done. You feel incredible relief. And what is the process, what is your discharge process? Let’s just walk through that. CG – You sign papers. DW – Where … First of all, can you tell us where you were? Were you working? You were out in space somewhere, right? CG – They take you to the LOC. CG – Lunar Operation Command, and you sign papers [saying] that you will not talk about anything …. CG – Nondisclosures. You sign a bunch of papers and then you go through a debrief that is an enhanced debrief, to where they put you into an altered state and then debrief you over the your entire service. DW – Is that some way of pulling information out of you? Almost like a computer hard drive, or where they’re hacking your thoughts, or is this more of them getting you to verbally disclose your whole career history? DW – What’s the telemetry that they’re getting? Why would they need to do that? CG – I don’t know. DW – Is it like lie detecting? DW – OK. So you kind of do a life review. How extensive does it have to be? Do you have to talk through year by year, experience by experience, or is it just highlights? CG – It was fairly detailed unless they saw something they wanted to focus on and talk about it. It was at the discretion of the person doing the debrief. DW – In your own case, was there anything that they felt the need to focus on and spend more time talking about? DW – Stuff that you don’t want to tell us? DW – OK. So, you go through this debrief process. How long does it take? In psychological time, how long did it feel like it took? CG – They were also doing blood tests, different things like that. It was probably 2 or 3 days spent at the LOC throughout the debrief and waiting process. There were other people going through it as well. DW – Were you in the same room each time? Was it all in one room while you were actually going through the debriefing? CG – The debriefing happened in one room, yes. CG – But there were other people going through the same process at the same time you were. So …. DW – In the room with you? DW – So you had a private room? CG – There were …. Let’s say there were a hundred people that had their time was up as well. CG – We were all there as a group. And one at a time, we were all going through the process of rotating through — being debriefed, getting shots, blood samples, that kind of thing. Going through the [discharge] process. DW – So, when you say the whole process was 2 or 3 days, that includes the social time, talking to these hundred people while they’re going through it one at a time? DW – And then the others are all hanging out? CG – Right. We were all kept on the base for that time period and were instructed not to talk to each other about logistical stuff. And, when you’re doing debriefs, you’re not supposed to "cross-pollinate," or talk about [what you did operationally in your specific tour of duty]. DW – With somebody that you spent 20 years with in space? CG – You get very good at it. You get very good at it, at small talk. DW – So what would you talk about? Like stuff from before you went into space, like cultural stuff from when you were still on Earth? CG – No, you could talk about small talk and stuff that happened in your daily life out there. CG – But not operational information. DW – Nothing specific about your mission, or what you were doing. DW – Were you in a private room at this point, or did you have to bunk with other people? When you were sleeping? CG – In the LOC, at one point, I was in a room with four people, but most of the time, I was by myself. DW – What would this room look like? How big was it? Did it have any furniture? 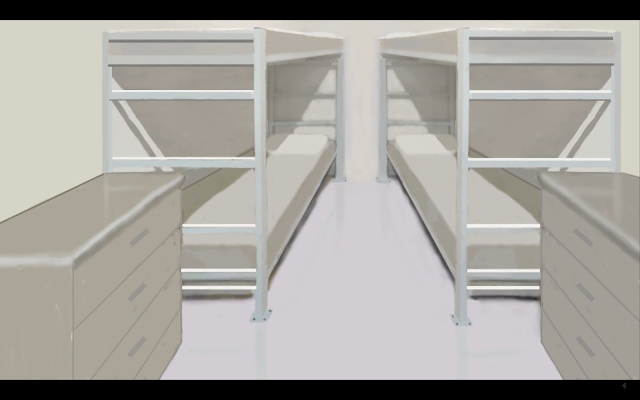 CG – Well, just four bunks. All the rooms were really small. CG – It’s not like apartments or anything like that. DW – Any décor, anything that made it look nice, or was it just very Spartan? CG – No, no. Just four bunks. One above the other. Really small, just big enough to get in, [but you would have to] walk past each other sideways. DW – And you said it’s not like Star Trek: The Next Generation. It’s conventional-looking doors, conventional rooms, conventional hallways, no windows, I assume. DW – So, then you go through this debrief and what happens next? What’s the next part of the discharge? CG – The next part [is] they take you down to the lower floors [of the LOC], where all of medical is. [This is] where they have huge a medical and science area, where they can repair injuries and just do all kinds of things. They take you to the area where they do the age regression. And …. DW – <interjecting> After they’ve cleaned up your injuries? Or healed a bad knee, or things like that? CG – No. They don’t do any of that. DW – <interjecting> But you had mentioned that they can do [repair all sorts of injuries at the LOC in the medical areas]? CG – Yes, that’s where it’s done. DW – But they’re not doing that for you, as part of the discharge? CG – Well, it’s not needed, because you’re about to be regressed. DW – OK. Well, let’s walk through this step by step. Do you go into a separate room? Is there like an age regression room? DW – OK. So let’s see what that looks like now. So you say it’s a lower floor. You go in there. Is there a large area where you see all these different medical things happening? Or are there like hallways with doors and rooms? CG – It’s like your typical pre-op room, if like you [were to] go [to] a hospital. DW – <interjecting> My goodness. CG – .... While you went through the process of them age-regressing your body. DW – So you’re in a private room now, with a door that’s closed? CG – No, this is like with the curtains. DW – Oh, wow. So there could be others from that group of one hundred. DW – You’re going to actually be only separated by curtains. 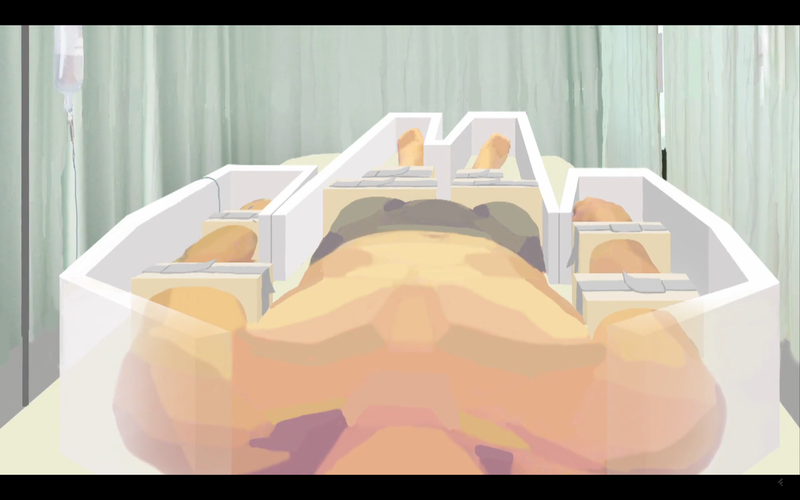 DW – In this larger operating room type looking area. DW – So there’s like heart monitors and beeping machines and technology like that around? CG – No. They don’t have to hook you up to that. All your telemetry’s read remotely, without having to touch you. DW – When you say you’re on a gurney, it just looks like a hospital bed. It’s not like some cool looking tube or anything they stick you in? CG – No. It’s just a hospital bed. Just a regular gurney. DW – <chuckling> Really. But they say they’re going to immobilize you? DW – <interjecting> And did they give you a reason for why? Like what happens if you’re not immobilized? CG – They, they say that you have to be kept totally immobile during the process. You can’t have any twitching or any moving throughout the entire process. DW – Wouldn’t your whole body go into atrophy if that happens? DW – Did they let you know that this was going to be told to you in advance, or do they save it right before it’s gonna be done, so you don’t get paranoid about it? CG – No. You don’t know anything about how the process works. I mean, they don’t even tell you any details about how the process works. They just tell you, "OK, we’re about to administer medication; you’ll start feeling sleepy; you’ll be able to respond to our commands, then we’ll administer more medication." And then the next thing you know, you’ll wake up, and it will all be over. And once they had administered the medication to where …. DW – <interjecting> Did they have you catheterized so you can pee during these 2 weeks? CG – I was not catheterized. CG – I guess it was some sort of anti-anxiety, or something that got you …. DW – Like nylon straps or something? CG – Uh, yeah. Velcro. CG – And they move you into another room. And this is where things are really, are hazy for me, because I’m already heavily drugged. CG – Heavily drugged. And they say that they’re going to push the medication, the sleepy med as they were putting up these white panels around my body. DW – Did the panels look like they might be some type of technology, like an energy-beaming technology? Image Source: The Sarcophagus from Stargate. Notice that the interior is white. DW – OK, so nothing that special looking. CG – And [with] that, I faded out. And at the end [of this process], you wake up and you are now the age you were when you first arrived [20 years before]. DW - What did that feel like? When you first wake up, I mean, did you feel like you were coming out of a terrible, terrible hangover? Were you very groggy, sick? CG – It was just like coming out of anesthesia, when you’re in surgery. You’re just nauseated, disoriented, groggy, achy, [etc]. You feel different, you’re in a different body, at this point, they want to do another debrief. DW – How soon do you get to see a mirror? CG – When I was able to be more interactive, [they] reminded me of all the things that I had signed [before]. And it seemed like the environment and the people were different. DW – Were you aware of being on the LOC still? Is that what it seemed to be? CG – I was [in] the LOC still, but it was different. Everything was different. DW – Like just a different wing, a different part of the facility? DW – Did you think that possibly you were now in a different time? CG – Yeah. That’s when, since you’re already drugged, they wanted to do another debriefing. [Possibly this is a secondary mapping process to help with the blank-slatting process. Or it could be intelligence gathering about the future, because at this point, CG is now 20 years in the past.] And then they would try to go through the blank-slating and the screen memories. They would try to do levels of screen memories to make you forget about the experiences [in the program] and then give you screen memories to make you have conflicting memories about where you were and what happened. Like give you memories of portaling to your room when you really walked back into your room, And it was a real a mind-screw. DW – So did it appear that they used the information that you gave in the first debrief, where you sort of verbally talked through your whole experience? Does that become like their laundry list of things that they’re gonna now confabulate every one of those with fake memories and alternate stories so that nothing really lines up anymore? CG – I’m not sure if they use that for that purpose. They keep a very detailed file on every person. So part of the debrief is [that] they’re verifying information and compiling information on their files, making sure they have correct information on personality profiles. And I’m sure that the first debrief was for several different reasons. But the, the whole part of them getting you back home is meant to be a groggy kind of process. I mean, if you’ve had major surgery [before] and been driven home shortly after, like if you had a knee replacement or something like that, you know, the whole thing is kind of a groggy kind of experience. And when the blank-slating started to wear off, as it always did [with] me the screen memories were there at first. I had memories of being portaled in and out of my room. But I also had memories of walking out to the car, out to the van, so I had kind of conflicting memories. And then the [real] memories started kind of rushing back, immediately back, when I was [a certain] age. DW – Do you remember? I mean, obviously, if you’re working out there for 20 years, you’re gonna be seeing yourself in the mirror. DW – Were there changes in your appearance over the course of 20 years? Was there a natural aging progression? DW – So, if you’re all drugged out, and just out of it, when is the first chance that you have to really notice what this procedure has done to you or the change that has occurred? CG – When you’re back home the next morning, you get up out of bed, you’re still groggy, walk into the bathroom at your home, you look at yourself in the mirror and you’re confused. DW – What were the most notable changes in your appearance? What did you notice that was different? Or did the blank-slating work so well at first that you thought nothing had happened? CG – At first, I was just really confused. And over the weeks the blank-slating started to wear off, and I started having a lot of the disturbing memories come back. A lot of the very upsetting stuff. I was having a lot of problems with the memories, and then the more organized, contiguous memories started to come flowing back. DW – When you say you were confused at first waking up, could you describe in a little more detail what you mean by the confusion. What was confusing? DW – Something isn’t connecting in your story here, which is, you’re in the LOC, you wake up after the regression.... [Then] you say that people and the facility look different. So maybe it’s 20 years back in time, in the past now that you’re in. DW – OK. And you’re all drugged out, and they give you another debrief. But then you’re not amnesiac yet? Right? You still remember what happened before, or when you’re under these drugs, are you just totally disoriented now? CG – I’m totally disoriented, but I, I still know where I am. CG – And I basically, I [can recall] everything, but I’m blitzed out on drugs like they give you for surgery, anesthesia. DW – So, what happens between the second debriefing when you’re blitzed out on drugs and then you being at home? How do they get you home? You’re on the LOC, and then what happens? CG – Well, I have the memory of walking back into my house, climbing back into bed, and going to sleep. And then I had a separate memory of being portaled into my room, climbing into bed, and going to sleep. CG – And, so, there was a conflict [between] the screen memory and the memory of walking up the front of the grass of my house, in through the front door, and then climbing [or] going straight to bed. The other memory that I walked in through a portal into my room. DW – What happened? What’s the last thing you remember in the second debrief? Did you end up losing consciousness again in the second debrief? CG – Yes. I remember going into the debrief and them starting to re-go over information. And then that’s all I remembered. DW – So they may have given you more injections, or some energetic something? CG – They did something. DW - So you have this very foggy memory that they confabulated. Maybe it was a portal, or maybe you just walked into the house. But then it’s when you wake up in bed, that the procedure has now kind of run its full course. And you’re waking up out of another very heavily drugged amnesia. CG – Wait, this is when I’m home now, right? CG – <chuckling> Yeah, OK. I was confused there. Yeah, so when I wake up at home, I don’t immediately have a memory of those other 20 years, but I’m still kind of confused, and something [doesn't] feel right. Something just didn’t just didn’t feel right from the beginning. DW – For all this service that you’ve done. CG – Yeah. That you’ll get free college, you’ll have [a] six-figure a year [income], you’ll live comfortably for the rest of. But they don’t plan on honoring that because they plan on erasing your memory and then just putting you off on your own. CG – Keeping you under observation. DW – Did you receive some form of payment while you were in the space program? DW – Do various people have more money than others? CG – No. There’s no money. DW – There’s no money. So, it’s kind of like being a slave. Or similar to, I guess, military service, where everybody basically just lives in the same bunks and has the same food and you don’t really get to have any possessions. DW – Are there any sentimental items you’re allowed to have during the space program that you can bring from assignment to assignment? Like if there’s an object that you decide you like, that you were able maybe to whittle something out of wood, or something that you have for yourself. Are you able to keep that with you from assignment to assignment? CG – People had little things that they kept, but usually you didn’t have much room [for these things]. You had a small little area to keep [a] couple of changes of clothes. Underwear and the things you needed, and that’s all the room you really had. DW – That’s your whole personal space. DW – Other than the beds. CG - Space came at a premium, and there wasn’t a whole lot of space for personal stuff. And people, there was no way to smuggle stuff from home, so people didn’t have, a secret, you know, deck of cards. They didn’t have a picture of their mom and dad. DW – Can you remember a specific example of someone you knew who had a sentimental item? CG – There was like notes, letters written between people that ended up forming bonds and relationships. CG – That kind of thing [was] in the program. But not any type of whittling or object like that. DW – OK. So it wasn’t like somebody would sculpt something. Or have an art project or anything like that? DW – No musical instruments. DW – OK. So, if they’re not honoring these contracts and not giving people free college and tuition and six-figure-a-year jobs, then it must be that this technology works really well on most people. CG – Yes. The blank-slating [or] memory wiping and screen memory technology will not work on 3-5% of people. They try and try and try, and the technology will not work. A lot of the other people, [the remaining 95%], the technology will work, [until] many years [later,] then [it] starts to breakdown. And usually, it will not start to breakdown until after that 20-year period they served. Like, let’s say that I didn’t regain my memories, I wasn’t an intuitive empath, I was an engineer of some sort. Around 2008, after that 20-year period that I would have served, the blank-slatting starts breaking down a little bit. DW – Is everyone kept on surveillance, so that they can monitor if that starts to happen? CG – People are monitored. Yeah. And, as I said, when you’re up there as well, you’re completely cut off from all information [about] the planet. So, no Internet, no radio, no TV. You can’t come back with, you know, who won the basketball or football game. Who won the elections. You don’t know any of that information [while you are in the program]. DW – You’re totally isolated from any information on Earth. DW – Do they feel like that would cause like a time paradox, some kind of problem if that were to happen? CG – I would assume that is why. When you’re in this type of service, they will just tell you the rules. You don’t get any type of communications from home. You don’t get any type of news updates. And you don’t get to [ask] why? "Explain to me why. Give me the details. Please break it down for me." It’s not that kind of a relationship you have with these people. DW – What is the year that you remember coming back? DW – Or, the splice point. CG – The splice point was just before I turned 17. So I was 16. [It] just before I turned 17. And they returned me back within a 6-minute, or so, window. I was close to 17 years old, right around 17-year-old mark. DW – Did you start to remember what you looked like when you were older [after you spliced back in]? CG – When I started to get into my 20s, I really knew what I was going to look like at later ages. I had seen myself as I was getting older, [from when I was in the program]. I had seen myself at that age before. DW – If someone forgets, what is going to be their subjective experience at the splice point? Is it going to be like they got sick and they’re in bed a few days, and like, "man, I just feel horrible?" <grimacing, as if sick> What’s their experience at the splice point? CG – They may think they have had a very strange dream, or they had some night terrors. They may think they had a little bit of a flu or something and [feel] nauseated. Just [that] something [doesn't] feel right. DW – How long does it take the body to recover from being 2 weeks in a coma, immobile? CG – I was fine and ready to return to my life within [a] couple of days. I was able to get my energy level back up and I was fine. DW – Are there any health complications from this, or is it just a really cool technology that works great? CG – People that have had this technology used on them report a lot of different neurological issues. With neurological issues in their arms, in their hands, in their legs. Some of the people that spent a lot of time out [in space] will have issues with their eyes. Cataracts, retina issues, but a lot of neurological issues. DW – And have you suffered those issues as well? DW – So, there’s really no way to have a government program that you can appeal for medical benefits. DW – Because this is all off the books and unacknowledged. CG – Yeah, you can’t just go to the VA.
DW –<chuckling> Huh. All right, well, this has been really fascinating. I hope you’ve enjoyed it too. I wanted to get through the whole thing, so this is going to be extra length compared to a typical episode. But I think it was worth it to cover all of this at once. This is Cosmic Disclosure. I’m your host, David Wilcock, and I thank you for watching. Click here for a Summary and Analysis of Season 4 Episode 4. For the previous episode in this series click here. 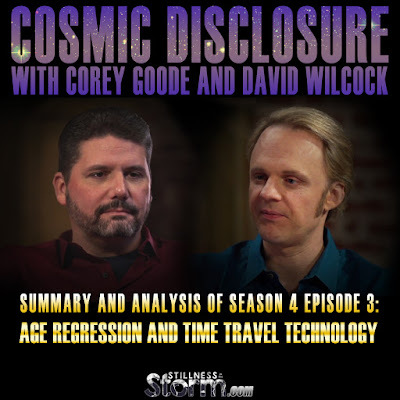 For Cosmic Disclosure summaries with David Wilcock and Corey Goode click here.